Forgive me and my ignorance for a moment, as I’ve never been much of a Barbra Streisand fan, mainly due to a lack of seeking out her films and prior albums. I recognized her greatness from afar but never dabbled in exploring her work, simply due to differing priorities. However, if every other year she continued to invite her movie star friends to perform a star studded album of old show tunes, she could make a fan of me yet. 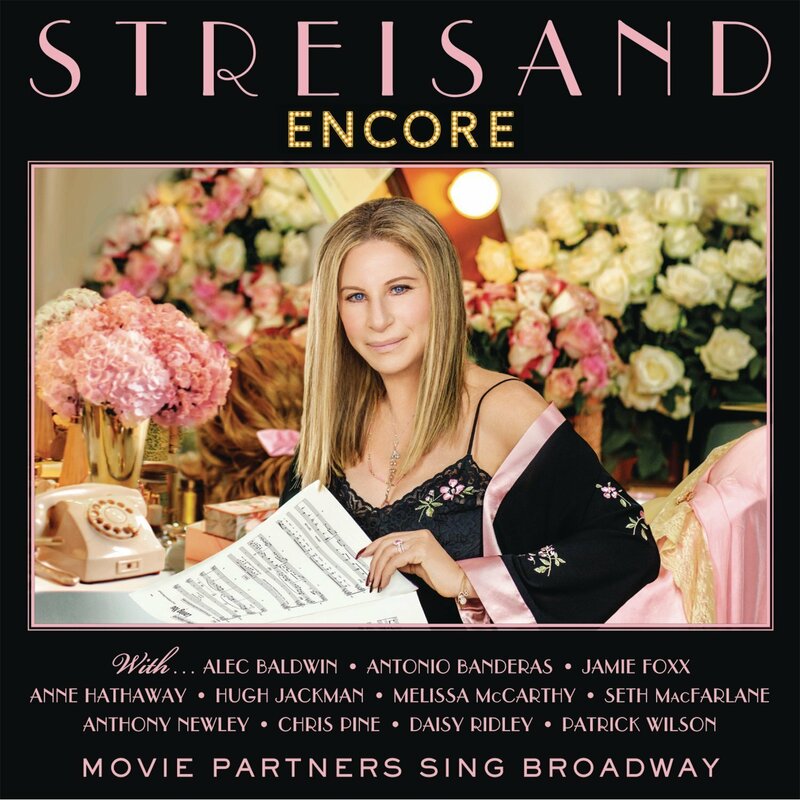 Encore is a rather self-indulgent endeavor on first listen, but a rather deserved one for Streisand at this point in her career. A titan of her craft, it’s a nice reminder of why she’s had such incredible longevity. She’s a powerhouse, she always has been and always will be. There’s no real purpose to the album beyond the fact that she can and she will but there are some rather touching performances within the album and a few revelations as well. More than anything it’s a way to allow fans to really take notice of the Hollywood talents who can sing and do so well. After being less than thrilled with him in Les Miserables Hugh Jackman redeemed himself on the title “Any Moment Now” from the musical Smile. Beginning with an introduction to the characters the song soars when their voices layer one another, Jackman’s timber gracefully laying against Streisand’s soulful vocals. We expect that Jackman can sing and hearing Alec Baldwin show up for an old school lyrical romp with the performer hardly surprises either but Melissa McCarthy’s appearance does and it’s an utter delight. So much so that now I’ll be the first clamoring to get McCarthy her own musical. She sings on the track “Anything You Can Do” from Annie Get Your Gun, a playful number that swaps out lyrics to better reflect their dynamic. McCarthy may not be the most technically astute singer, but she has boundless personality that shines through with each word. It’s a rare song on the album that allows Streisand to demonstrate a greater amount of energy. Things slow down again with the whimsical classic “Pure Imagination” which, in a rare choice, is made into a duet between Streisand and Family Guy himself Seth McFarlane, a shocking reminder that despite how abhorrent I find his shows, his can croon along with the best of them. The number is simply stunning. Equally vocally delicious is “Climb Ev’ry Mountain”, another cinematic classic with Jamie Foxx taking on the role of duet partner. Perhaps because it’s been a while since Ray or because I have a shoddy memory but I was blown away within seconds of him singing. I don’t know about you but I pretty much swooned on cue. It’s a song that’s absurdly familiar to many of us who have grown up on The Sound of Music but it’s given an extra edge when these two voices crescendo over one another. There were two songs in particular however that caught my ear. The first being a duet mash up of the songs “I’ll be Seeing You”/”I’ve Grown Accustomed to Her Face” which rely heavily on emoting and Streisand and her singing partner Chris Pine are more than up to the task. Sure we’ve seen him ham it up for Into the Woods in “Agony” but this duet allows us to witness a softer, old school crooner vibe that the actor possesses. It’s a sweet, lingering song and Pine might be the more delightful surprise of the album. But it’s the popular “At the Ballet” that truly won my heart and, blasphemous I know, it wasn’t because of Streisand herself but because of Anne Hathaway and Daisy Ridley who sang opposite her. From the show A Chorus Line it’s one of the more familiar songs on the album and Streisand couldn’t have picked anyone better to accompany her, almost to the point where they distract from her. Ridley is an actress who I continue to adore with every passing moment and her being able to sing was simply icing. She’s fervent in the number, passionate and more than any of the three really delivers on adding a character to the portrayal but Hathaway walks away with the song. A line as simple as “Maggie do you want to dance” freefalls over you due to the utter sweetness in her voice and unburdened desire and hope. If this leads us to seeing Ridley and Hatthaway in a musical, I’ll be more than happy. But ultimately, this is Streisand’s album and more than anything it’s a reminder of why she is so beloved. Her voice is effortless. She sings and it comes forth as if it were second nature and perhaps, at this point, it is but it doesn’t make it any less impressive to behold. She’s a star in the entertainment world and this is yet another reason why.